Seeing our dog excitedly curl up in a sun patch always puts a smile on my face. I would curl up with her but she gets annoyed that I’m stealing some of her rays. Is that someone else than Biff? Because I can’t see any eyebrows! There was a very specific place with a sun patch on the stairs in the house we lived in before. The cats liked to be there, but there are no sun patches (at least what I know of) in our apartment, because we always keep the curtains/blinds down. I still cannot see the past 4 pages (or navigate anywhere the archive for that matter) without being redirected to some checking-cashing webpage. Is there an ETA on getting rid of that? Oh weird! I didn’t know about that one I’ll look at it right now. AHA! So THAT’S how he’s able to regenerate pretty much anything on his body. For personal protection from rattling off to malware/weird ad sites, Google [hosts file]. It checks before going out on the Web, if the URL is on the list, to look for it on your OWN machine (127.0.0.1 is ‘home’). Saves time, and stress. Works on all browsers, all OS’s (I use Firefox in Ubuntu; just fine). 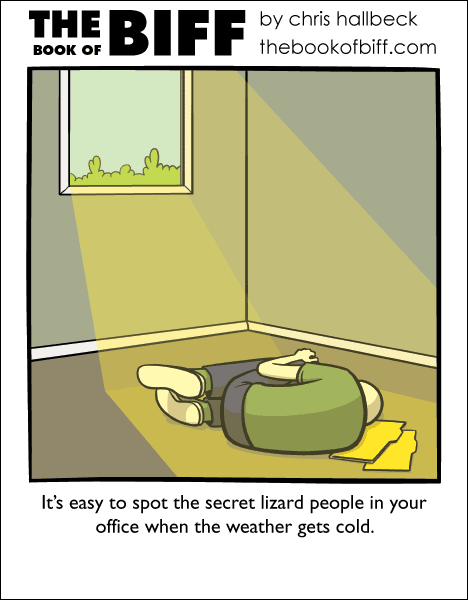 Just realized I must be part lizard; after 3-digits (oF) last month, we have drizzle and 60s this week, and THE @#$% HEATER won’t stay on! Happy birthday you apparently don’t care too much about, Chris! I’m no lizard, but there is merit to occasionally finding a nice flat rock to warm yourself on.